OS grid reference SW 9126 3863. On the hilltop overlooking the beautiful Gerrans Bay in south Cornwall stands a fairly prominent ancient burial mound or round barrow (tumulus), dating from prehistoric times, rather than the more recent so-called Dark Ages, as was often thought from the Cornish legend of the saintly King Gerrenius. 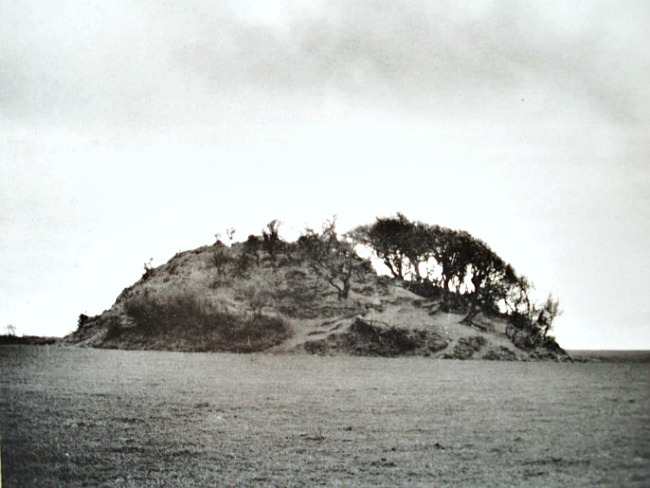 The man-made mound known as ‘Carne Beacon’ is covered in trees, bushes and grass and stands at the south-side of a farmer’s field (near Churchtown farm) ringed by a barbed-wire fence, but with a gate at one side for access. The site can be reached from the village of Veryan 1 mile to the north, or from the hamlet of Carne half a mile south, via footpaths around the edges of the field where the mound is located. The A3078 St Just and Tregony road is roughly one-and-a-half miles to the west of Carne Beacon. Just to the north of the ancient burial mound are the earthworks of an Iron-Age fort or settlement known as ‘the Veryan Rounds’. Carn Beacon is between 15 and 28 feet (upto 6 metres) in height, depending on which part of it you’re standing on, and it has a circumference around the base of 370 feet (113 metres). During World War II it was used as a lookout post; a concrete pillar can still be seen on the top of the mound from this structure. It is considered to be the largest Bronze-Age burial mound in England. According to the ‘often accepted’ legend, a golden boat with golden oars was buried inside the mound in the 6th century AD along with a Dark-Age king; the boat in question had been rowed across Gerrans Bay from Dingerrin carrying the body of the saintly King Gerrenius (Geraint) of Dumnonia (Devon) who had died in his palace there circa 555 AD. But there was also a St Geraint or Gerran who lived about the same time and founded the church of St Gerrans-in-Roseland, which has rather added confusion to the legend, perhaps, although we known that a certain King Geraint figured in the ‘Register of Llandaff’ concerning St Theliau (Teilo) a 6th century Welsh churchman who had cause to travel through this part of the country on his travels to Brittany at that particular time and was well received by that king; so are the two saints Gerrenius and Geraint one and the same, quite probably. One legend informs us that St Just, son of King Geraint, had been converted to christianity by the Irish female saint, Boriana (Buryan). St Just in Roseland, Cornwall, is named for him. A St Geraint is commemorated on the 16th May. Some accounts also confuse things more by saying that King Gerrenius lived in the 7th or 8th century? The antiquarian, John Whittaker, in his work ‘The Ancient Cathedral of Cornwall’ says that “when Gerrenius died, he was brought from his castle of Dingerein and ferried with great pomp across Gerrans Bay in a barge plated with gold”. 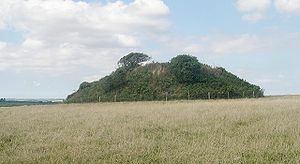 The site of Dingerein or Dingerrin castle, a sort of crescent-shaped earthwork, can be found near Trewithian, Cornwall, some 4 miles to the west of Carne Beacon. It seems that the good Dr Whittaker never got the chance to excavate the great mound, even though the local people had got word that he was going to do so and had been given the ‘day off’ work for this wonderful event. In 1855 the mound was finally excavated, but sadly, or perhaps unfortunately, no golden boat with golden oars was found – only a cist-type grave inside slabs of stone, like a small chamber, was found along with some ashes of burnt bones and charcoal. Whether these ashes were those of King Gerrenius of Dumnonia we may never know. But this very ‘fanciful’ legend has proved to be a good story told down the centuries. The cist grave (cairn) would most probably date from the Bronze-Age. The almost circular-shaped earthworks a short distance to the north of Carne Beacon is all that now remains of an Iron-Age hillfort or settlement that is locally called ‘the Rounds’, ‘Veryan Rounds’ or ‘the Ringarounds’. Whittaker, John Dr., The Ancient Cathedral of Cornwall History Surveyed, (2 vols), London, 1804. Westwood, Jennifer, Gothick Cornwall, Shire Publications Ltd., Princess Risborough, Buckinghamshire, 1992. Readers Digest., Folklore Myths and Legends of Britain, Readers Digest Association Limited., London, 1977. Farmer, David., The Oxford Dictionary of Saints, (5th Edition), Oxford University Press, 2004. Spencer, Ray., A Guide to the Saints of Wales and the West Country, Llanerch Enterprises, Lampeter, Dyfed, 1991. Categories: Artificial / Man Made Mounds, Burial Mounds / Round Barrows, Carne Beacon at Veryan in Cornwall | Tags: Carne Beacon at Veryan in Cornwall | Permalink.